Surroundings - Shanti Leprahilfe Dortmund e.V. 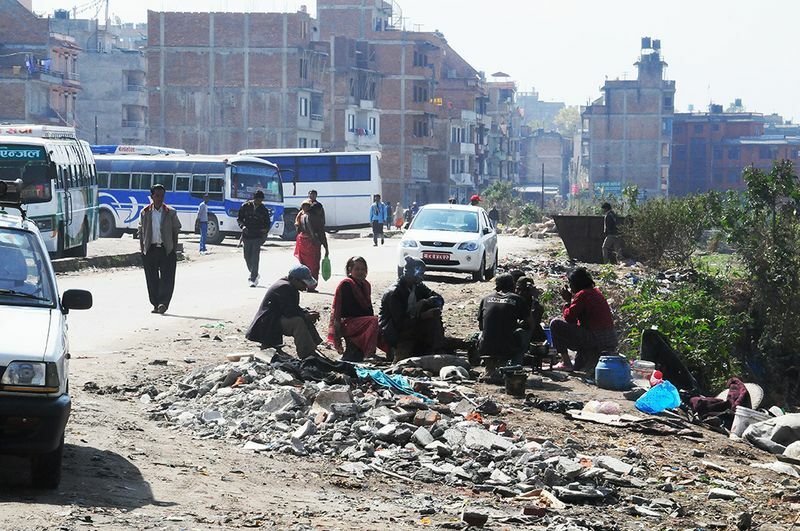 What a startling sights: an injured beggar sits amidst refuse in the cesspool of the Bagmati “river”. 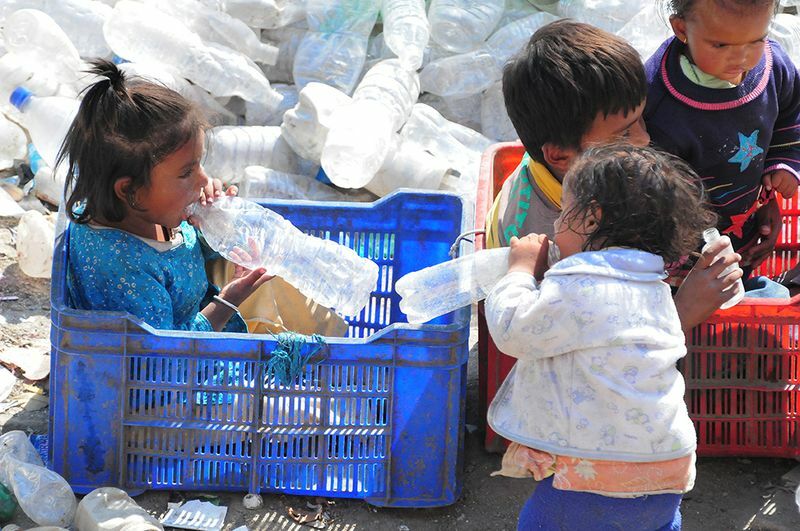 The sick and needy would also be doomed to this fate had they not found a home at Shanti. A family “picnic” alongside the street near the bus station. Next door to the Shanti station: a dump for plastic refuse, which is sorted here. In the midst of it all: children playing. The station in Kathmandu-Tilganga is like a small island amidst noise, pollution and the clamour of the big city. One need only step outside the door to see how often the disabled or sick would have to live if Shanti did not exist. 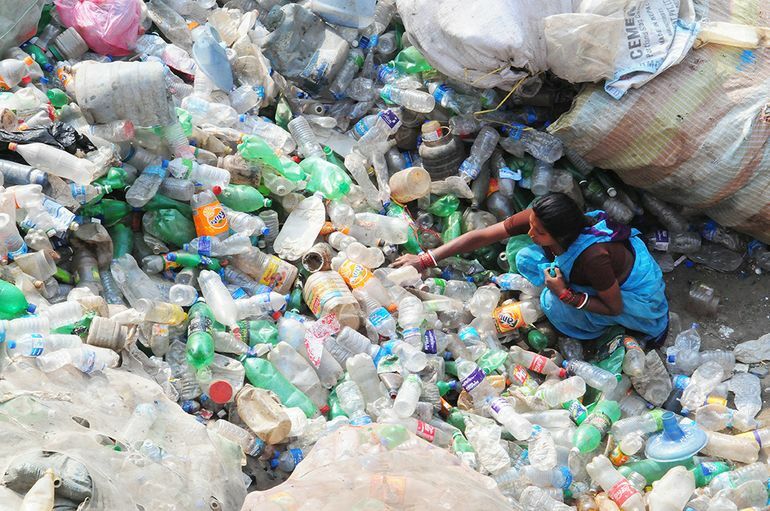 Next to the Shanti buildings is a dump for plastic bottles, for example. Empty plastic bottles are unloaded here by the sack. People remove the paper labels and reuse these plastic bottles. In the midst of it all: children playing. The Shanti property borders a bus station, where thousands of people arrive and depart from every direction. Directly adjacent, the Bagmati River flows thousands of miles to the south before reaching the Ganges, a holy river for the Hindus. For this reason, the Bagmati is also a holy river, into which the ashes of the deceased Hindus incinerated in the Pashupatinath Temple are cast. This “river” is more a cesspool filled with filth and refuse. The riverbanks overflows with rubbish of all kinds. That's why it is such a blessing for so many residents to have a fountain with clean drinking water available at Shanti. The infection rate for diarrhoeic illnesses like cholera, typhus and dysentery in the neighbouring quarters has dropped by 60% as a result.